Mrs & Mr Swan had babies! I wanted to congratulate the couple on their new little cygnets. 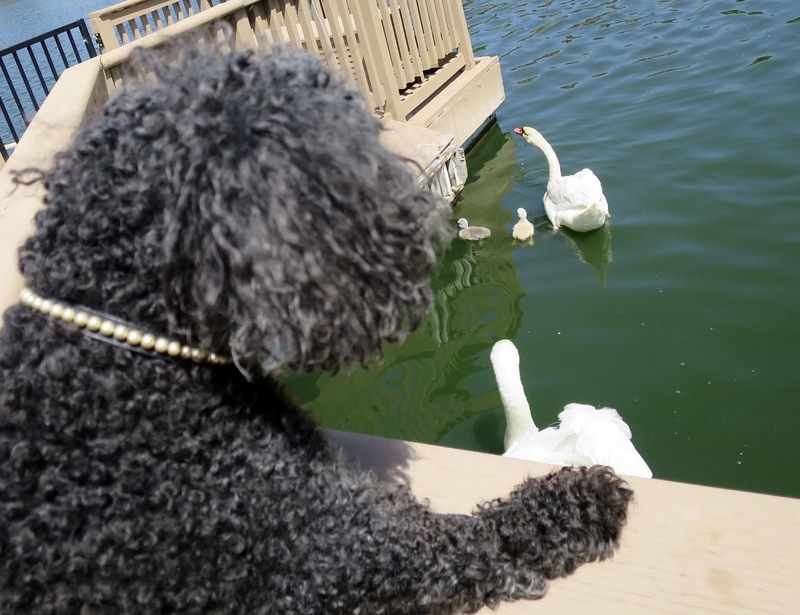 But Mr. Swan came over and told me to keep my distance and not bark and scare the babies. I thought that was a reasonable request. So I went to the dock to watch with the humans. How adorable! OMP! What a terrible time! 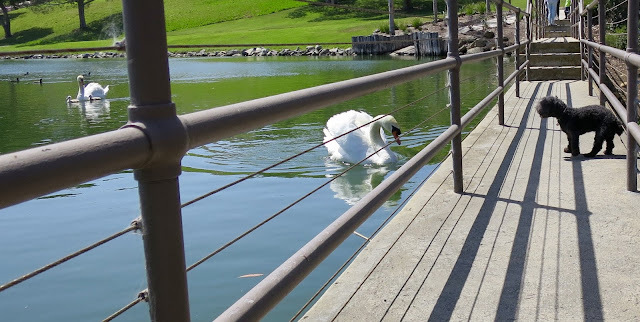 We walk right by the swans and Mr. Swan likes to swim beside us. Mommy doesnt let me chase him anymore, & Annie is no longer interested. Now with the babies, we will definitey be keeping our distance (except Mommy insists on pics and video!) BearHUGs & RosyPoodleKisses! What a beautiful family. Mother Swan looks very proud as she should be. Rosy, you were very respectful of the new little family by watching from a distance. Yes! I see them everyday and continue to be respectful. If I even act like I will start barking, Mommy puts me in the stroller and turns it around! BearHUGs & RosyPoodleKisses! How cute, Rosy! It's so good that you understood Mr. Swans request! I bet it was fun watching the little ones. Its so fun! And I see them everyday so I have been watching them grow! SO sweet! BearHUGs & RosyPoodleKisses!